This restaurant offers a large selection of reasonably priced and tasty Western and Khmer food. Large range of fresh seafood. The full bar (including cappuccino machine) has a fantastic selection of fresh fruit juices and lots of cocktails. E.g. try the Teenycolada, an alcohol free cocktail! 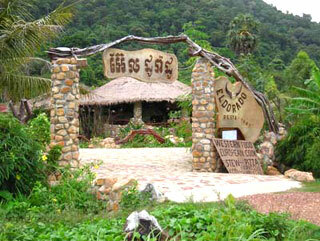 The restaurant features lovely home cooked Khmer food with a big range of seafood. Western food is also available. The large dinning area can accommodate large groups as you may come with a bunch of people starving for fresh seafood. This place offers a smaller range of food, but has a nice surrounding as it sits right next to the shore. The food is very delicious and comes at reasonable prices. The fresh prawns with Kampot pepper is a dish you shouldn?t miss here. It?s opened until 9:30pm. The restaurant is located opposite of the major beach just right next to all the small bamboo shacks. It features a rooftop restaurant serving Khmer and Western food including seafood. There is also a stylish separate beachfront bar overlooking Kep Beach. The prices are upscale.